I am as certain as I can be that the businesses that will create the greatest solutions to the world’s energy, environmental, health and social issues will be businesses built on the principles found Holacracy. At present, it is such a leading-edge concept that the word ‘Holacracy’ has not yet found its way into many dictionaries and likewise only a small but growing percentage of businesses use Holacracy. Interestingly, the businesses that have fully embraced Holacracy are tremendously innovative and are having a disproportionately higher transformative social, environmental and financial impact than traditional businesses. Whilst ‘Holacracy’ is a term many people have not yet heard of, I believe that it is the future! It is a revolutionary new approach to creating and building businesses that will transform the world we live in. The author and creator of Holacracy has built a number of successful software businesses using Holacracy, several other highly successful businesses have also adopted Holacracy. So it is not some madcap pie in the sky theory, it is based on real-life ground-breaking results, some of which are extraordinary. 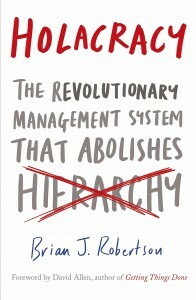 I recently felt compelled to sit down to read this book for the third time in 3 years and making even more extensive notes about how I can use the principles of Holacracy to transform businesses by re-inventing the traditional fundamental structures found in the vast majority of businesses. Holacracy enables radically more dynamic adaptable businesses by eliminating the traditional business hierarchical structures that most people assume are compulsory. The author of this book Brian Robertson is typical of the entrepreneurs that I strive to work with, poeple who are driven to pursue a higher purpose to make a difference to others whilst also making a greater profit. After Robertson’s own journey of working for other businesses and then starting his own business, he had a realisation that traditional business structures are not very dynamic, if someone in the business is aware of a challenge or has a tension or an insight, they need the resolve and confidence to raise such a matter and then they have to rely on their boss (and their bosses boss) to see what they see. This takes time and often the decision makers are remote from the situation, so they are not best placed to make such a decision. 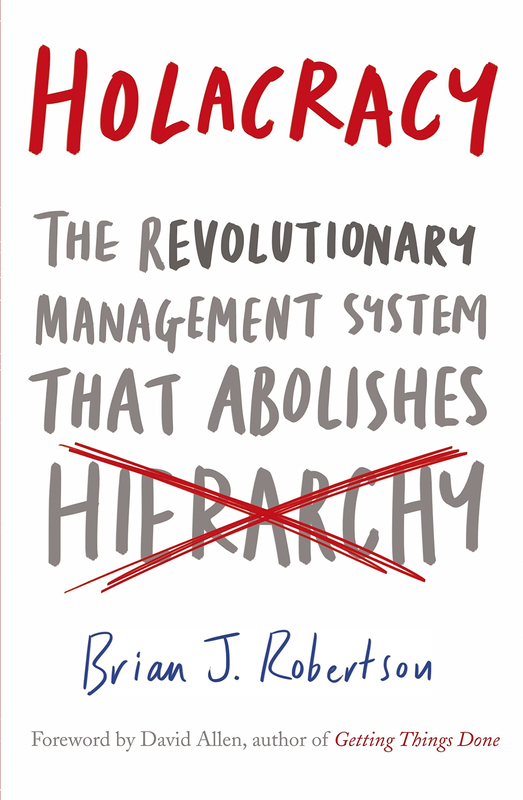 As you read this book you will discover that Holacracy is a proven, dynamic revolutionary approach to creating and building businesses that eradicate the traditional ‘command – control, hierarchical structures’ that currently shape the vast majority of business on our planet. I referred to one of the best real-life examples of a successful Holacracy based business in my April 2018 review on the book ‘Delivering Happiness’ by Tony Hsieh (http://www.alistairlobo.com/delivering-happiness-tony-hsieh-book-month-april-2018). Tony is the CEO of Zappos (The world’s first $1Billion on-line shoe store) who are one of leading Holacracy based business in the world. Interestingly, the only reason Tony has the title ‘CEO’ is that it is a legal requirement to have a CEO. With Holacracy in it’s purest form, in theory you don’t need a CEO and a Board, although for current day legal and practical reasons you will have, however, the authority of the CEO and Board is much narrower as authority is spread throughout the business to those who are best placed and thus entrusted with this power. Holacray based businesses like Zappos also typically outperform traditional businesses on several other metrics not usually considered important and rarely measured by traditional business for example ‘Personal Emotional Connection with individual customers’. Let me give you a practical example of the dynamism that is only found in the distributed authority found in Holacracy. When I was in the Zappos Head Office in the Customer Service Area, a lady called because her ‘happy shoes’ as she called them had been delivered to the wrong address twice due to a computer issue (an extremely rare situation at Zappos). The shoes were a present for her daughter’s birthday which was the next day. Under the structure of Holacracy Zappos recognizes that the person speaking with the customer on the phone is the person with the emotional connection and understanding of the customer and their particular situation. Thereby to solve any issues with this client the Zappos team member dealing with the customer has more authority to resolve the issue than ANYONE ELSE in the business including the CEO! Indeed, the Zappos team member dealing with this lady issued her a triple refund on the spot and arranged for 24-hour courier delivery of the shoes. This is a real example of the dynamism that can only be realised in a governance structure based on Holacracy, it would not be a situation you would find in a traditionally structured business. As well as explaining the underlying premises of Holacracy using some beautifully constructed metaphors Brian Robertson explains how you might go about implementing Holacracy in your business based on numerous real-life experiences. My only warning about reading this book is you will probably need to read it several times (and maybe get the audiobook) in order to assimilate much of the information.